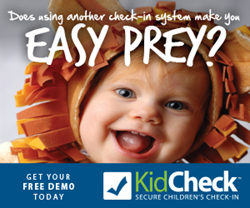 KidCheck, providers of secure children’s check-in software, is leading a session in the “Children’s Ministry Safety and Security” webinar hosted by children’s ministry leader Dale Hudson and Building Children’s Ministry on January 24, 2018. More about KidCheck can be found at http://www.kidcheck.com. It is vitally important to be aware of the potential danger and be armed with information to help keep predators out and children safe. KidCheck, providers of secure children’s check-in software, is leading a session in the “Children’s Ministry Safety and Security” webinar hosted by children’s ministry leader Dale Hudson and Building Children’s Ministry. The webinar takes place January 24, 2018. Child safety and security is one of the most important issues facing organizations caring for children, and the webinar is designed to help provide churches with the necessary knowledge and training to be prepared to protect the children and families in their care. The webinar will provide best practices and actionable information on the importance of making safety a priority, recognizing predators, and safeguarding ministries. Angela Lewton, KidCheck child safety expert, is leading the session “Predator Proofing Your Ministry”.